According to Polk/IHS, Tesla has passed Nissan to become the best selling Electric car in Canada for the 2013 year. 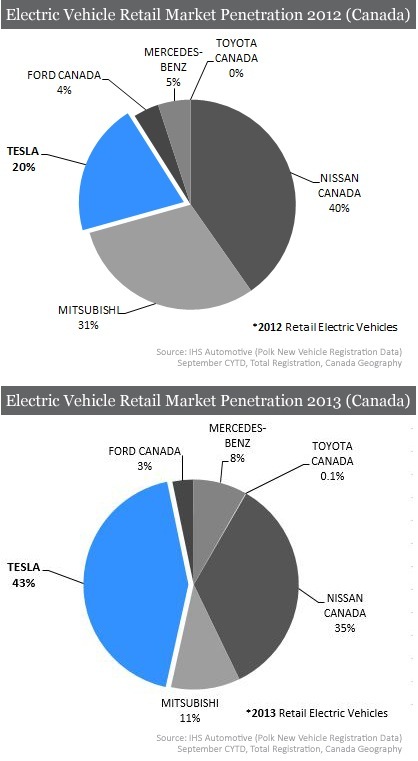 It moved from selling 20% of Canada’s Electric Cars in 2012 to 43% of the cars in 2013. Consumer research shows that within its release year, the Model S captured a staggering 20% of the electric vehicle market share. Over the course of the next year (2013), it more than doubled to 43%, outselling all other OEMs. It is important to note that with such tremendous gains, Tesla did not necessarily conquest customers from other electric vehicle OEMs, but instead, brought new customers from outside the electric vehicle market to grow the current EV customer base. After all, the current EV competition includes the Nissan Leaf, Mitsubishi Imiev, Smart Fortwo, Ford focus EV, Toyota Rav4 EV and the Chevrolet Spark.